The legendary Lone Wolf and Cub preparing for battle. When thinking of candidates for our ‘Man Crush Monday’ post, I wanted to look at characters that embody the type of values that inspire others to be more than they believe they are even capable of. A man that possess a wealth of knowledge, immense physical and mental strength, skill, honor courage and determination. Ogami Itto, the Lone Wolf, is all these things and so much more. For those who don’t know who he is, Ogami Itto is the star of an influential ‘Manga’ series called ‘Lone Wolf and Cub’ which first began publication in 1970. Created by writer Kazuo Koke and Goseki Kojima, Ogami Itto was once the ‘Kogi Kaishakunin’, the Shogun’s executioner. It was a position within Tokogawa era Japan that brought great influence, but also jealousy. Itto finds his position is under threat from the ‘Ura-Yagyu’ a shadowy clan of ninja assassins that work on behalf of the Shogun but have been secretly plotting his downfall. Under the command of Yagu-Retsudo, the Ura-Yagyu carry out their plot, murdering Itto’s entire household bar his young son Diagoro. 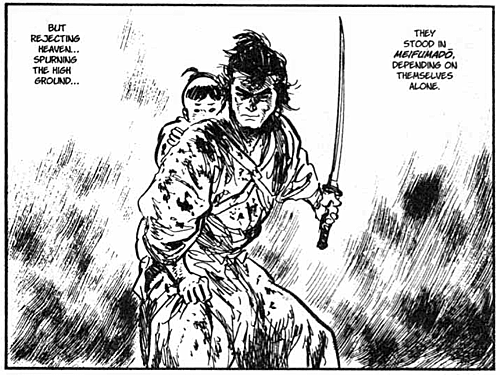 The Ura-Yagyu then frame Itto for murder, forcing him to become ‘ronin’ and escape to a life on the road with his son. Itto internalizes his grief and pain and channels it into purpose. He tests his son’s resolve in one of the most nail biting scenes you’ll ever read. He places a ball and a sword on the ground in front of Diagoro and demands the 1 year old boy make a choice. Of course, Diagoro chooses the sword ( which is just as well as had he chose the ball, Itto would have ended his life there and then!) and vows to gain revenge on the Ura-Yagu and restore his honor. He and Diagoro form a formidable assassin team know throughout feudal Japan as ‘Lone Wolf and Cub’. Carrying out assassinations and executions for a fee, Itto leaves those he encounters with wisdom and his targets without their heads. One of my favorite stories from the series is when Itto encounters a downtrodden woman, who has lost her husband and is left with his debts, She is forced to sell herself to survive under the control of a cruel, greedy pimp. Itto is so moved by the woman’s suffering, that he agrees to free her from her virtual slavery and kill her cruel master for no fee. Itto becomes a living embodiment of controlled rage, but he never loses sight of his own humanity. 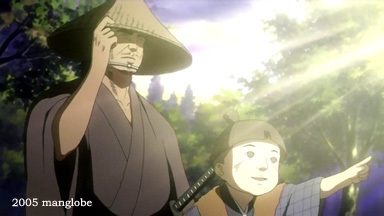 He allows Daigoro time to play and discover the world around him, and even helps his young son rescue a friend when she is captured by fanatics aiming to wipe christians out of Japan. For his new mission in life, Itto equips Diagoro’s baby cart with a number of hidden weapons. Spears, and spikes are at the ready, and Itto is not shy about using them against his enemies! Itto is also good to his vow, wiping out everyone of Yagu-Retsudo’s children and single handedly destroying the entire Korokuwa ninja clan. Eventually Itto finally enters into confrontation with his hated enemy Retsudo and what follows is a titanic battle that spreads across two books and is one of the longest sword battles committed to paper. Itto’s skills are so formidable that it takes a combination of a crooked swordsmith ( who is really a Yagyu ninja in disguise) and poisoning to defeat him. Itto’s death is as dramatic as a hero of his nature deserves. But though Ogami Itto has died, his influence lives on and on. He has made a number of cameo appearances in various guises over the years, making a ‘blink and you’ll miss it’ appearance in Shinichiro Watanabe’s ‘Samurai Champloo’ and in Cartoon Network’s ‘Samurai Jack’ as well as being the driving influence behind the main character of Max Allen Collins’ ‘Road To Perdition’. Itto has also appeared in a number of films, which are so legendary they deserve their own post, so i’ll revisit that at a later date. 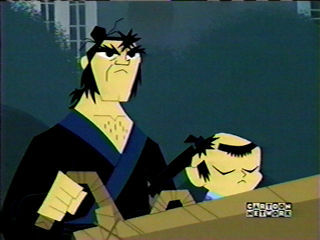 Itto makes an appearance on ‘Samurai Jack’ ..
..and also on ‘Samurai Champloo’! So here’s to ‘Lone Wolf’, the mighty assassin, slayer of ninja, defender of the downtrodden, warrior and father.